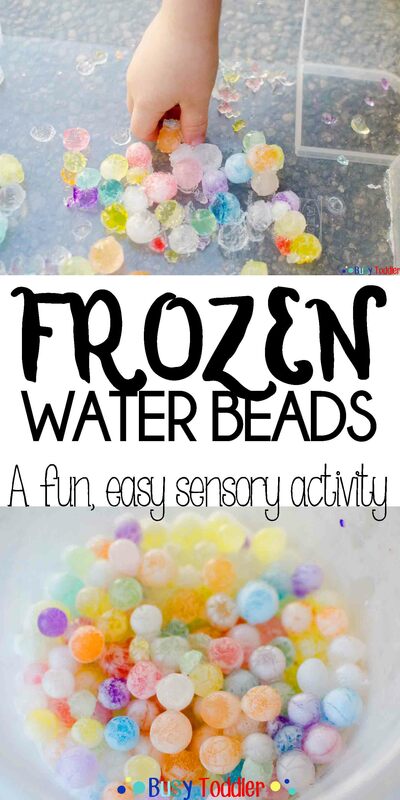 Frozen water beads makes for one awesome sensory activity! 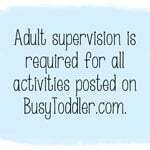 Water beads are just about the coolest toddler activity supply known to man. I wish that was hyperbole, but it’s just not. They are little beads of heaven and they are fantastic for kids to play with. We played with frozen water beads the other day and oh my goodness – talk about turning your world upside down! 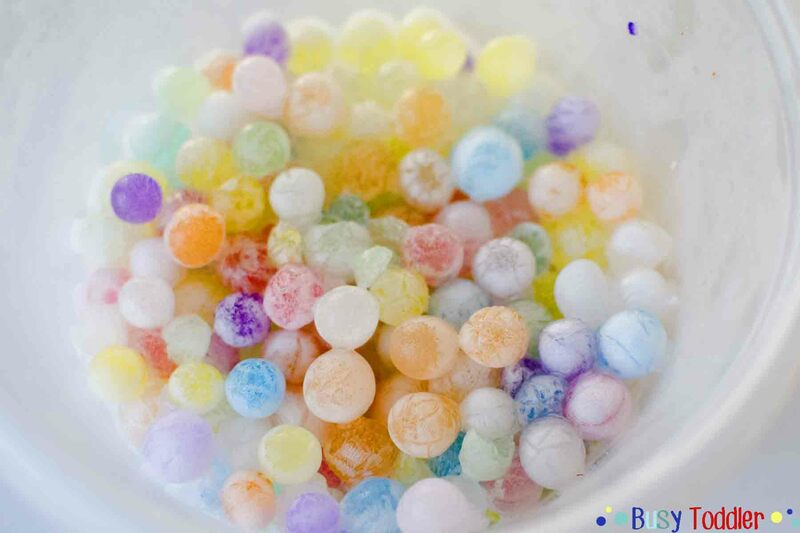 Generally speaking, water beads are a supply florists use to make arrangements look pretty. They start out the size of a pin head and grow over the course of about 8 hours in a bowl full of water. Trust me – just growing water beads is exciting enough. Playing with them and freezing them – good night Martha! Before we go any further, please please please know your audience when using water beads. 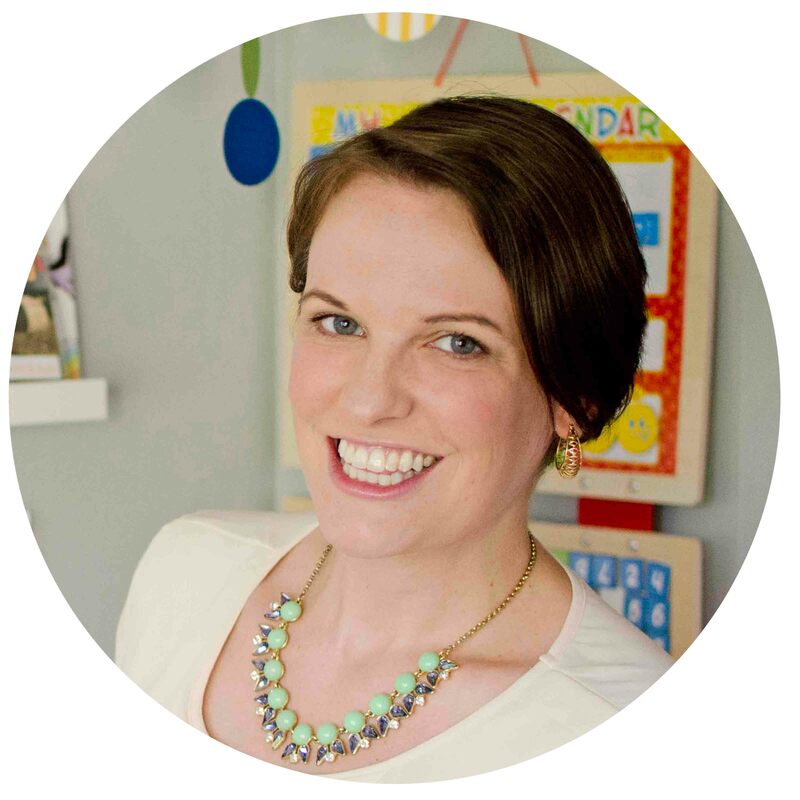 If your tot is still in the “everything goes in my mouth” phase, it’s best to wait a bit to try any water bead activities. We started with them at 25 months old. My 15 month old is so curious about them but she has a ways to go before she can play with water beads. She just can’t be trusted yet (wink). 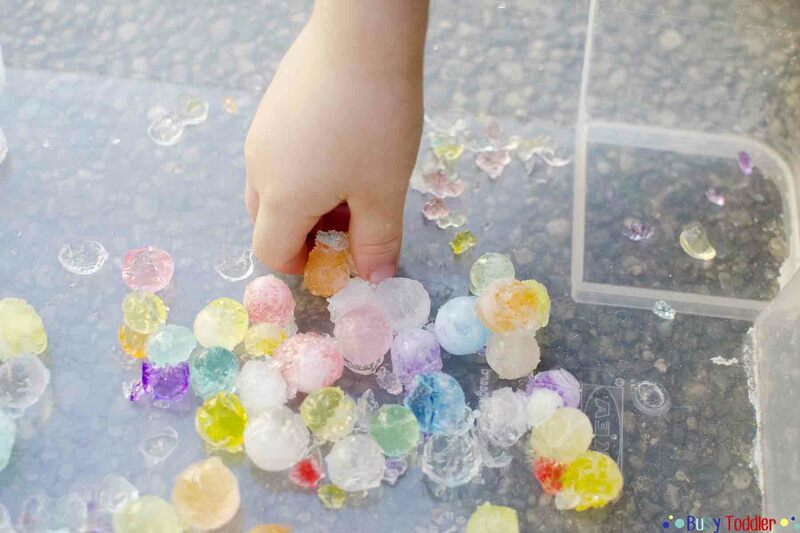 First, we grew our water beads – which is absolutely just as fun as playing with them. Watching them grow from pin size to marble size throughout a day is just plain awesome. After they were grown and ready, I used a slotted spoon to scoop them into a plastic container. I stuck it in the freezer and started the waiting game. We didn’t have to wait long! Thirty minutes after putting them in the freezer and they were already turning into frozen gems. We gave ours a full hour to cook…er…freeze and wow! We were so excited to pull them out and see how they had changed. I put the frozen water beads into a larger plastic tub so there would be lots of room to play. My son went nuts for this and (let’s be honest) so did I. Together, we picked them up, rolled them around, scooped and played. We whacked them with a toy hammer (you know, why not add a little fine motor skills work into this sensory play time?). I also gave my toddler a squirt bottle of warm water to squirt and thaw them with. The cold sensory experience this created was awesome. What a great way to spend our morning! I will say, sadly, the water beads did not come “out” of the freezing process well. They pretty much died once they thawed. But the brilliant part about water beads is that for ONE TEASPOON worth (that’s what’s pictured here), we can usually get a weeks worth of play time with these guys. So, next time, we will freeze water beads as our final activity. It’ll be the perfect way to end water bead play from now on. Frozen water beads made for a great toddler activity time at our house. 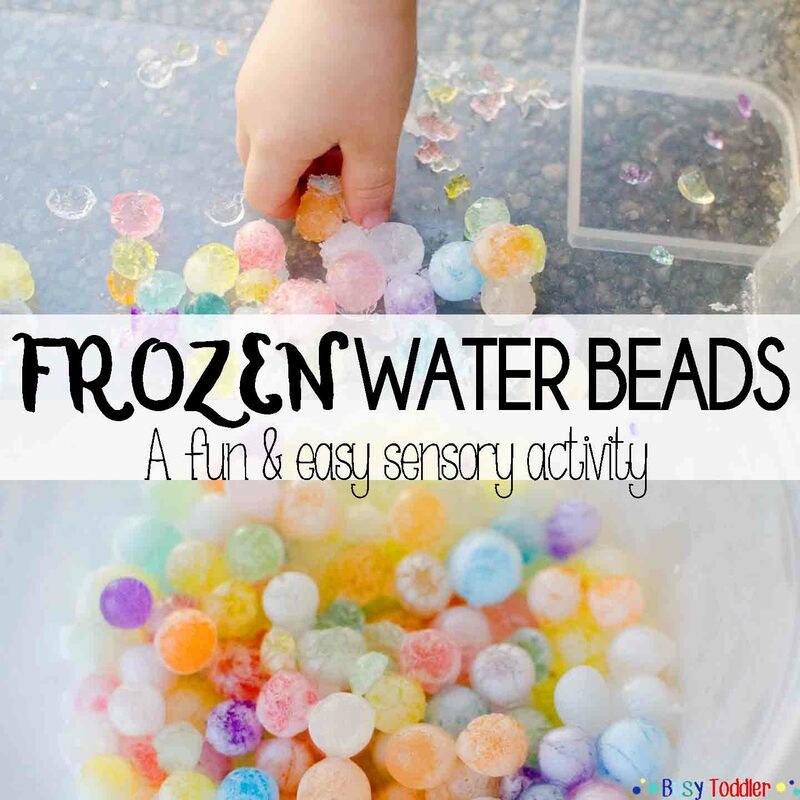 We can’t wait for our next frozen water beads adventure! Looking for more water bead ideas? 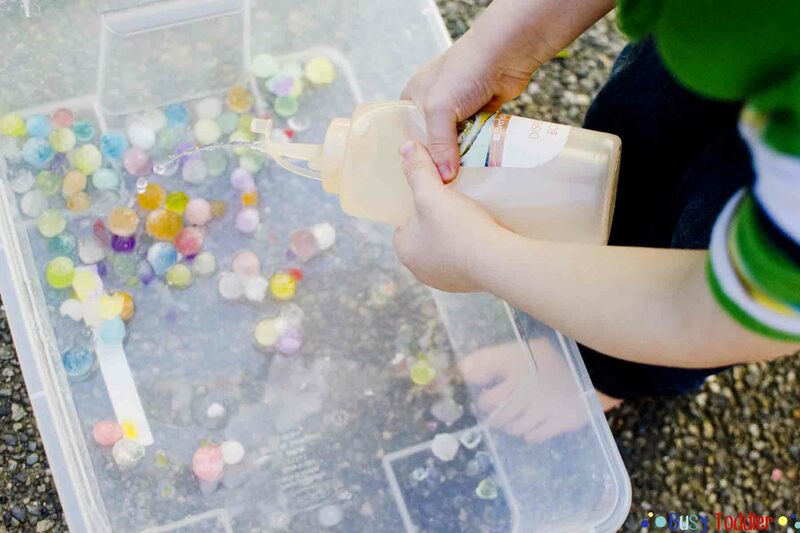 Check out this earth inspired sensory bin, emotions sensory bin, and the wonderful world of water beads. 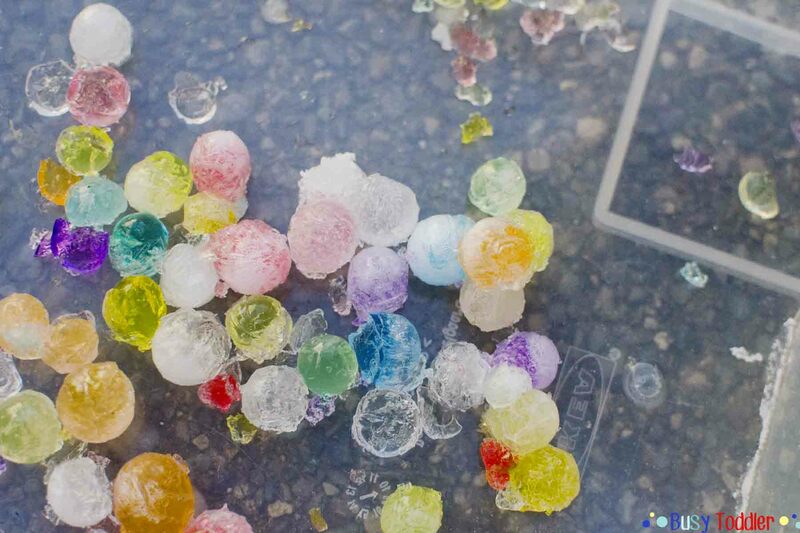 What would your kids think of frozen water beads? This is genius! I never would have thought to freeze them! I’ll have to try them this summer on one of the many hot days we have! So awesome! My daughter loves water beads but I never thought to freeze them! Will have to try this over the summer! What do you mean they died when they thawed? Did they just crumble or what? I’m so curious. Thanks for the idea! Exactly what you thought – they CRUMBLED!! I was shocked but it was still worth it. How long do they last once they are taken out of the freezer? Sadly, not long. Once they unfreeze they sort of die/crumble apart. That’s why I use them a bunch of time throughout a week then make frozen water beads the last activity so I’m not killing a good, fresh batch. They grow in the water – they don’t dissolve or color it. They are traditionally used by florists but are really fun for sensory based activities.